Steve Cameron: Science Fiction & Fantasy Author: Eight Miles High. While there are some of us who don’t even like the thought of getting on a plane for long hauls, I’m someone who really enjoys those flights. Maybe I just don’t get on planes often enough, but I take great delight in checking-in, boarding and then being seated. I know the thought of reaching my destination excites me, but so does the flight. And then I really start to relax once the announcements start. I have a relative who flies a lot on business, and I’m sure he would disagree with me. Simply going to an airport is exciting enough. I’m always happy to go even just to drop someone off or pick someone up. They are exciting places – the hustle and bustle, the international-ness (it’s a word now, OK?) of it all, people excited about going, excited about meeting those who have been away – just the whole atmosphere. But to be the one who is actually getting on the flight is just awesome. I love reading the in-flight magazine (Andromeda Spaceways Inflight Magazine should sign a deal to get that publication on flights), the choice of channels and films, the computer games, the drinks and even the food. Then there’s the rumble of the engines, the increase in force as the machine hurtles down the runway, and the wonder that something so heavy can actually fly. I spend quite a lot of time just looking at clouds and geographical features from the windows. Maybe I’m still a kid at heart but it all amazes me. 2. Having the nosecone ripped off the plane and go through an engine on ascent out of Detroit, then spending two hours in a shuddering machine as we circled dumping fuel before an emergency landing. 3. Not the steward who spilled coffee on me as he was about to pour me a cup as the plane bumped, but the steward directly behind him who immediately positioned his jug over my shirt and asked, “Would you like milk on that, sir?” He made me laugh. 4. The first time I flew to the UK in 1985 (after not being back since leaving at 8 months old) and just looking out the window and being wowed with a sense of homecoming. 5. Boarding a flight where there were six burly detectives around a handcuffed guy they were extraditing. He obviously didn’t want to go and started yelling and headbutting the seats in front of him until they took him off for everybody’s safety. 7. 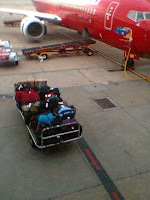 Arriving home in Australia after living in Japan for six years. Sure, I’d been back a couple of times for a week here and there, but this was coming home and the flight was fantastic. And so this afternoon I’ll be boarding a flight and heading off into the wild grey yonder. You’ll tell me that I’ll be spending 24 hours in a small armchair, with little legroom, average meals films I normally wouldn't want to watch, And I’d respond just as Maxwell Smart would. See you from the other side of the world.